2018 Update: The Trump administration is discharging immigrant recruits who joined under MAVNI to gain citizenship through service. The risk of a foreign-born terrorist threat was a reason. If the administration was genuinely concerned about terrorism within the ranks then it should focus its efforts on weeding out white supremacists from the military. According to the Military Times, “[n]early one in four troops polled say they have seen examples of white nationalism among their fellow service members, and troops rate it as a larger national security threat than Syria, Iraq and Afghanistan.” Even more troubling is that some white supremacists who participated in the Charlottesville confederate statue riot were active duty military. Trump’s stance on the Charlottesville riot that left one woman dead makes it clear that white terrorism in the military is not a concern. The hate and fear mongering against immigrants is malicious, especially when noted that “since Trump took office, more Americans have been killed in attacks by white American men with no connection to Islam than by Muslim terrorists or foreigners.” For a man captivated by military might, Trump is doing everything to undermine military strength by discharging immigrant recruits when 80% of military recruits are already turned away due to obesity, lack of education, or criminal record. The Trump administration is discharging immigrant recruits who joined under MAVNI to gain citizenship through service. The risk of a foreign-born terrorist threat was a reason. If the administration was genuinely concerned about terrorism within the ranks then it should focus its efforts on weeding out white supremacists from the military. According to the Military Times, “[n]early one in four troops polled say they have seen examples of white nationalism among their fellow service members, and troops rate it as a larger national security threat than Syria, Iraq and Afghanistan.” Even more troubling is that some white supremacists who participated in the Charlottesville confederate statue riot were active duty military. Trump’s stance on the Charlottesville riot that left one woman dead makes it clear that white terrorism in the military is not a concern. The hate and fear mongering against immigrants is malicious, especially when noted that “since Trump took office, more Americans have been killed in attacks by white American men with no connection to Islam than by Muslim terrorists or foreigners.” For a man captivated by military might, Trump is doing everything to undermine military strength by discharging immigrant recruits when 80% of military recruits are already turned away due to obesity, lack of education, or criminal record. Trump’s fascination with the military is dangerous. His preference for flexing military might over diplomacy is a threat to the world. His behavior during foreign trips lacked tact and diplomacy such that key allies no longer look to America as a defender of democracy. Tawfik Sharkasi said, “An unhealthy and uneducated nation is a weak nation.” Trump’s rhetoric and posturing towards North Korea, Syria, and increasing troops in Afghanistan assumes that the US military is ready to engage battles on all these fronts. Military service was a fast track to citizenship. Unfortunately, Trump’s DACA repeal means that eligible recruits and possibly those currently serving will be discharged. According to the NY Times, “Immigrants currently represent about 13.5 percent of the United States population…[and] represented 5 percent of those in the armed forces and about 8 percent of Army recruits last year.” 80% of military recruits are turned down. A Pentagon study gave three major reason for this: lack of adequate education, physically unfit — obesity, and criminality. If the military turns away 80% of recruits, Trump’s transgender ban and rescinding DACA/Mavni drops the number of eligible recruits to abysmal levels. Considering the low number of eligible recruits, we cannot afford to turn away eligible recruits because they are transgender or using military service to fulfill citizenship requirements. The Pentagon study bolsters Tawfik argument. Republicans have a love affair with defense and military initiatives. However, America’s military prowess is limited by policies enacted by Trump and Republicans that hinder an educated nation. Betsy DeVos education policy flies in face of everything that the study stated is necessary to have eligible recruits. Republicans and Trump do not value education as a human right. Democracy is built on an educated citizenry. A strong military is built on an educated populace. Nearly a third (32 percent) of all young people have health problems — other than their weight — that will keep them from serving. 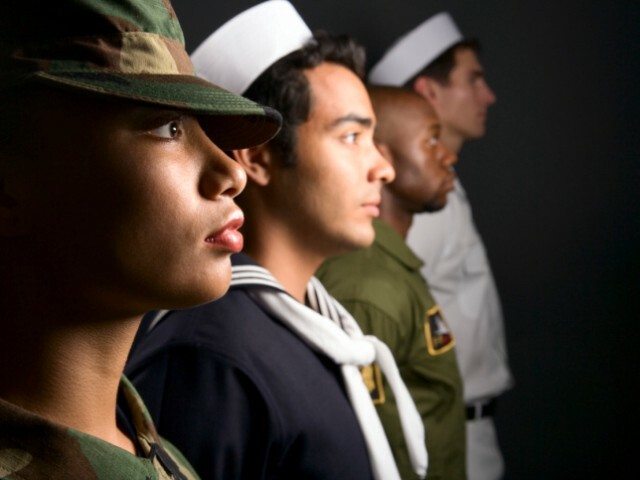 Many are disqualified from serving for asthma, eyesight or hearing problems, mental health issues, or recent treatment for Attention Deficit Hyperactivity Disorder. When weight problems are added in with the other health problems, over half of young adults cannot join because of health issues. Additional young people are not eligible to join because of drug or alcohol problems. Even when recruits qualify, health problems can cause significant deployment and expense problems later; for example, 20 percent of the Army’s reservists arrived at mobilization sites with dental conditions that made them non-deployable. The study summarizes the problem. “One in 10 young adults cannot join because they have at least one prior conviction for a felony or serious misdemeanor (and for five percent of young adults, trouble with the law is the only thing keeping them out).” Here again, I return to a statement by Tawfik. “More Americans are killed domestically from gun violence, mass shootings, and drug abuse than from terrorism. Violence can be attributed to a lack of education, economic means, and drug and alcohol abuse. More Americans are killed by these issues than terrorism. Yet, instead of a focus on education, funding for privatized jails has increased. Privatized jails have one incentive — increase shareholder profit. The only way to accomplish that is to put more people in jail.” The Trump administration rescinded Obama’s stay on privatized prisons. The push for privatizing prisons means that fewer Americans will be eligible to serve. In light of the Pentagon study, one would think that a push towards education, physical fitness, and rehabilitation over prison for non-violent offenders would be a goal, as such makes America strong. Unfortunately, Trump’s make America great again has nothing to do with building the country’s best interests. As the late Republican Senator Margaret Chase Smith stated, “It is a national feeling of fear and frustration that could result in national suicide and the end of everything that we Americans hold dear… Those of us who shout the loudest about Americanism in making character assassinations are all too frequently those who, by our own words and acts, ignore some of the basic principles of Americanism — the right to criticize; the right to hold unpopular beliefs; the right to protest; the right of independent thought.” It seems as though Senator Smith foreshadowed a Trump presidency. This originally appeared on Ronda’s website, Ronda-isms.